What Is Tracking and Why Use Short URLs? One of the most important aspects of advertising is tracking and analyzing the results. Tracking means monitoring the results of your advertising and other mobile marketing efforts so that you can determine what works and what doesn't. Then, based on the results of your tracking efforts, you can analyze your previous strategy and improve your next advertising campaign so you can get more people to respond to your advertising message and get the results you want. Over the years, tracking has developed into a science. There are very precise ways to measure results employing complex software and formulas, and there are simpler ways that rely on what you can learn through trial and error, such as A/B testing. A/B testing means utilizing two different campaigns and simply comparing which one performs best in a focus group. In the online world, the more complex methods are involved in what are called analytics. Businesses can hire a third-party company that specializes in providing analytics to perform the tracking for them. With the popularity of mobile messaging, it's become necessary to track how people respond to the mobile advertising messages received on their phones. For businesses that use SMS marketing services to send coupons or special offers to their customers, one of the simplest ways to track the effectiveness of these efforts is to require the customer to show the message to their waitress or clerk at the time of purchase. You just keep a running count, and the results are obvious. Another tracking method that's been used for years in print advertising is the use of SMS keywords. A different keyword can be used for each ad piece you use to ask people to send a text message to join your mobile club or receive a special offer. That way you can determine which ad gets the most opt-ins. The benefits of tracking for businesses that employ mobile marketing strategies are numerous, and every seasoned marketer will tell you that you're wasting your time and money if you don't put methods for tracking into place. The primary reason for tracking the behavior of your contacts, is that it's the only way you can learn how to make changes in your campaigns in order to make them more effective - which ultimately translates to more sales. At ProTexting, there are several ways to track the campaign performance and success. We offer SMS keywords (for different campaign tracking), Short URLs, Real time messaging status, Device & App Forwarding, etc. Why do we use Short URLs? We suggest that all of our clients use our proprietary Short URL technology for all of their SMS marketing campaigns (available FREE in all accounts). 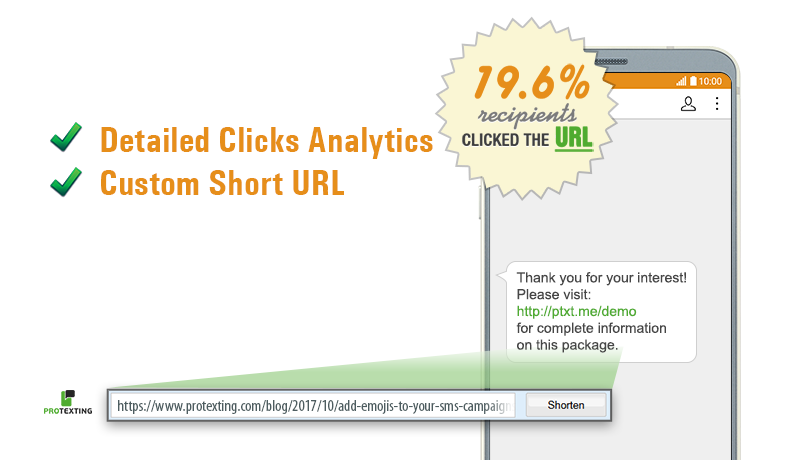 By shortening the URL in the message, we gather tremendous amount of analytics to better build the campaign’s analytics. We also track WHO, WHEN & WHERE clicked on the link, which will give a further way to target your audience.